You can build a high-end chair that will last lifetimes. I will help you in a 1:1 manner in my Arlington, VA workshop studio. 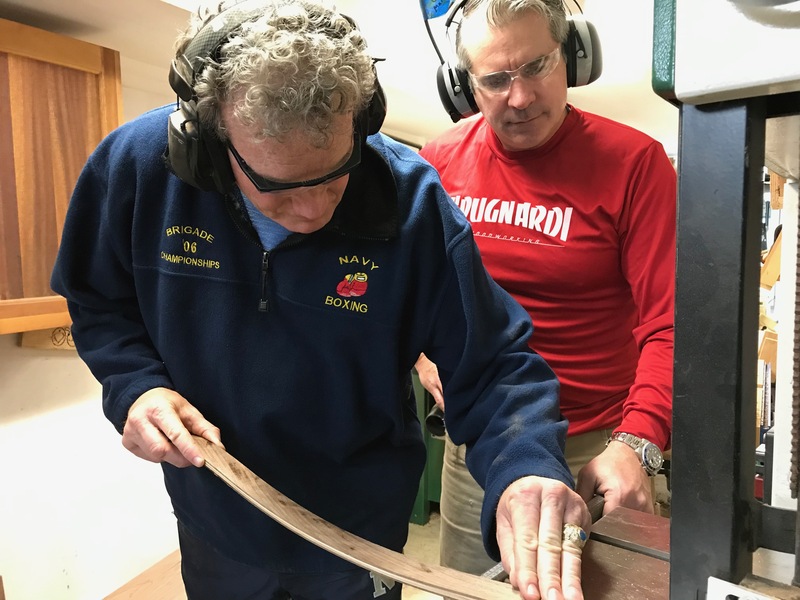 Whether you are an experienced woodworker, or have absolutely no experience, you will learn the entire chairmaking process – from how to pick out rough slabs, to layouts, to cutting parts, to milling, to joinery, to sanding, and finishing. 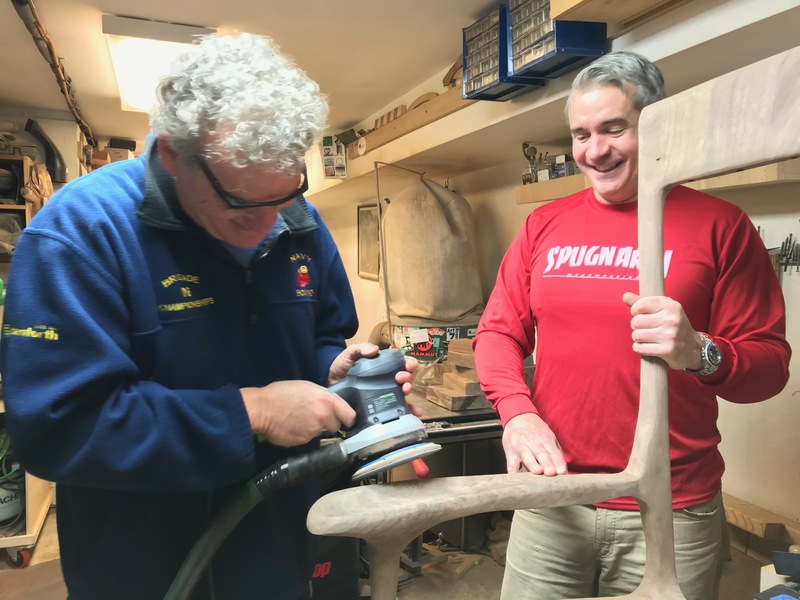 My favorite part of 1:1 chairmaking is building relationships with clients. Much like sherpas helped early mountaineering expeditions, I serve as your furniture-making sherpa to deconstruct a rather complicated chair with up to 130 individual components into a manageable process. 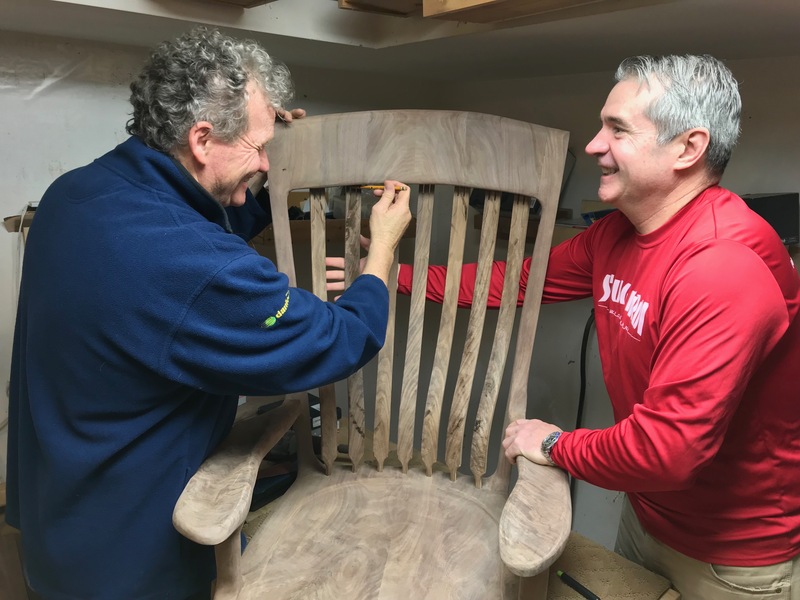 We work together to set up reasonable timeframes to build a rocking chair, bar stool, wheeled office chair, or dining chair. This timeline can take from a month to several months, depending on your schedule. 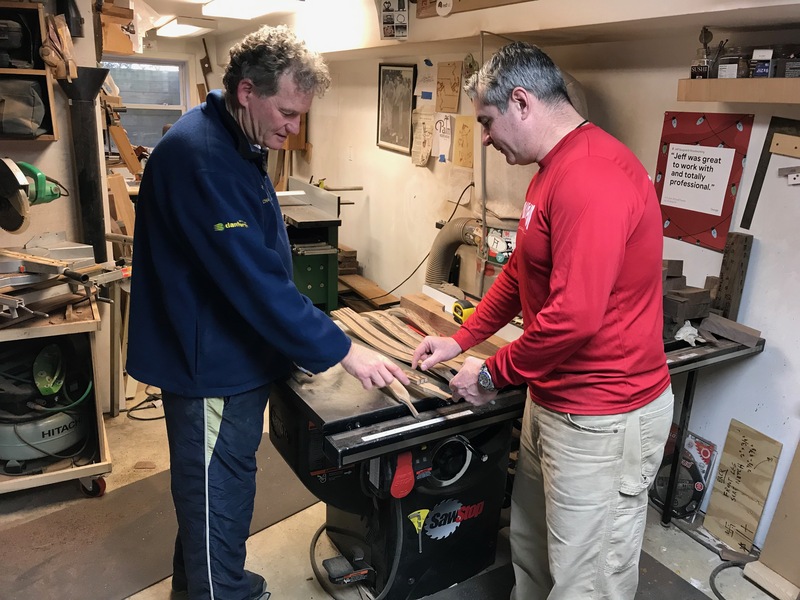 This process starts when you and I meet in Virginia wine country to pick out rough slabs, then continues with the checklist of how we build the chairs iteratively. Luckily, the chair we build has a completed chair in the showroom studio, so we can visualize what we are doing before we tackle shaping, sanding, drilling, or whatever task is in hand. Check out this video to learn more about this “Build Your Own Chair” process. Many clients make an event of the chair unveiling, and invite friends, neighbors, family, and work colleagues over for this special occasion. When the furniture pads are removed, seeing the attendee’s faces light up with smiles and amazement culminates this process perfectly. Your friends will get to see, touch, and sit in something you created that is stunning. We will both be proud that we created a beautiful chair. Contact me at jeff@spugnardi.com or 703.634.3632 to learn more and schedule when your chairmaking class will begin. Spugnardi.com is copyright by J.C. Spugnardi. All Rights Reserved.